Tattoos, as we all know, signify something. Whether it be the memory of a loved one or reaching a specific point in ones life. 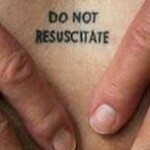 Now, we are seeing more and more tattoos that serve medical purposes. For example, a warning. 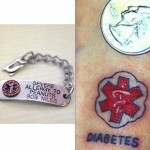 Some patients with severe diseases will get at tattoo that aids in assistance. Explaining or depicting what needs to happen or what did happen, when the person is unable to help or explain on their own. Another reason for a medical tattoo is cancers, when a woman has breast cancer and mastectomy it is common to use tattooing to replace or fill in the areola to help in forming a more natural looking breast. And some people, who are required to wear an allergy medical bracelet will simply get the information tattooed directly onto their skin. Either way, medical tattoos are becoming more popular with patients. Adding to their confidence level and providing important information to anyone that comes to the rescue.